Not one, but two heads of cabbage went under my knife this past weekend for back-to-back versions of this dish. 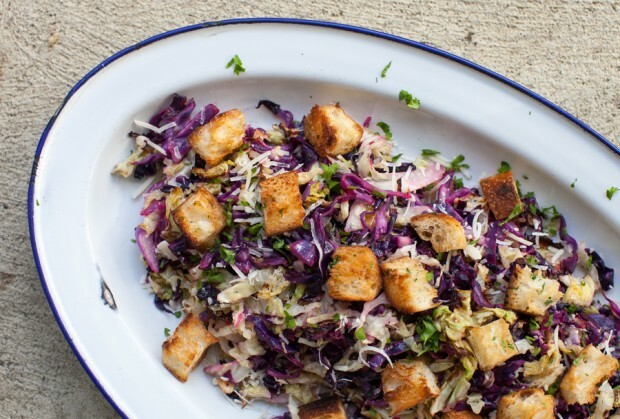 Inspired equally by The Kitchn’s cabbage slaw with hazelnuts, and a crouton recipe from fantastic new-to-me cookbook At Home with Lynn Crawford , this roasted cabbage salad with brown butter croutons it is a new fast favorite of Danny’s and mine. I’ve always been a fan of roasting vegetables, but cabbage has to be one of my preferred greens to go under the broiler. It takes on a sweetness without a trace of the bitterness that often accompanies Brussels sprouts and other brassicas. A touch of Parmesan brings a welcome touch of saltiness to the salad, while a generous squeeze of lemon livens up the whole plate and complements the smokiness of the cabbage. If all fall salads are as good as this one, I won’t be thinking twice about bidding summer greens farewell. Preheat broiler. Remove the core from both cabbages. Roughly shred cabbages with a knife and place in a large bowl. Toss cabbage with olive oil and spread half of it on a roasting sheet. Broil, for about 5 minutes, until well wilted and slightly charred. Repeat with remaining cabbage. Return all roasted cabbage back to the bowl and toss with lemon juice, Parmesan, and parsley. Taste for seasoning and add a sprinkling of salt, if you like. Transfer to a serving bowl or platter and garnish with croutons. Serve warm or at room temperature. Recipe from Lynn Crawford's new cookbook 'At Home with Lynn Crawford'. Cut bread into 1-inch cubes and place in a medium bowl. In a small saucepan over medium heat, melt butter and allow to brown slightly. It should change color and take on a nutty aroma. Pour butter over bread cubes and toss to coat evenly. Spread in a single layer on a parchment-lined baking sheet. Bake, stirring a few times, until crispy and golden, about 10 minutes. Remove from oven, cool slightly and toss with chopped parsley. Have you fallen for the humble cabbage yet? I love the flavors and color of this dish! gorgeous! I like the sound of roasted cabbage! I need to try it! Looks amazing, Aimee! Making me want this for lunch right now! brown butter croutons?! you’re killing me, Aimee! This salad looks all sorts of fab! A baguette is indeed an ingredient! In fact, I sent my husband to the market last night for the sole purpose of procuring one to make Caesar salad croutons. I love cooking cabbage so that it gets all caramelized and toasty. Thanks for an idea for a new way to dress it! Thanks for the idea, just as I was thinking about a veg dish for tonight. And I don’t have access to an ‘awesome baguette’ but I do have a tired loaf of seeded rye! That sounds even better! Enjoy. I have all of the ingredients for this – and I think it’s being added to my menu for tonight! I want to eat this right now! When I saw the photo, I thought ‘If there’s parmesan in that, I’m in!’ Have to get some ingredients, but will put it on our menu plan for this or next week. This looks seasonal & full of flavor! My daughter’s preferred cabbage is Savoy! I’ve never tried it under the broiler. Thanks, Aimée. 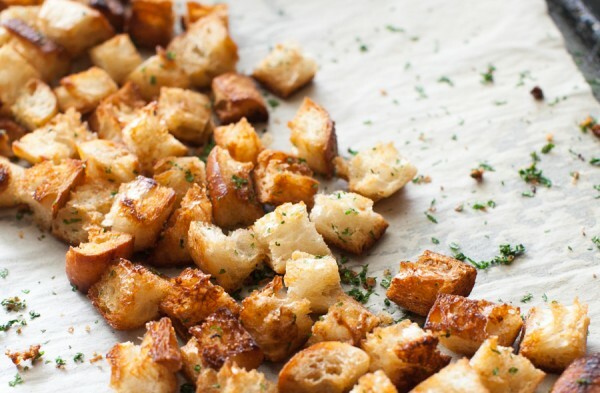 I’ll make my croutons with the ends of my sourdough, since I’m ready to make a new loaf of bread. Sounds so good and I have way to much cabbage and don’t know how to use it! I love the addition of Parmesan as well! 🙂 if you have a money, do you mind heckling my blog out please? Thanks! This salad looks so delicious and I love how unusual and full of flavor it looks! Mmmmmm. Without an oven, I think for this one I will do a cabbage stir-fry, maybe with asparagus, garlic, and tofu. I love pretty food, and this is really pretty food. I don’t eat many salads in the fall, I just don’t think about salads, but this I will definitely try! So many delicious things in one dish, love the Parmesan and the addition of the sausages. Cabbage is such an awesome autumn dish. And brown butter croutons?! Yes. Please. I haven’t bought cabbage yet this year, but this is going on the must-make list. Especially with baguette croutons. LOVE. Love the flavors and colors in this dish! Perfect idea for a dinner party. I’m with ya girl! I always have fresh baguette on hand in case of emergency! you can make it into just about anything! I was just wondering what to do with the half cabbage in my fridge! Thank you! So interesting. 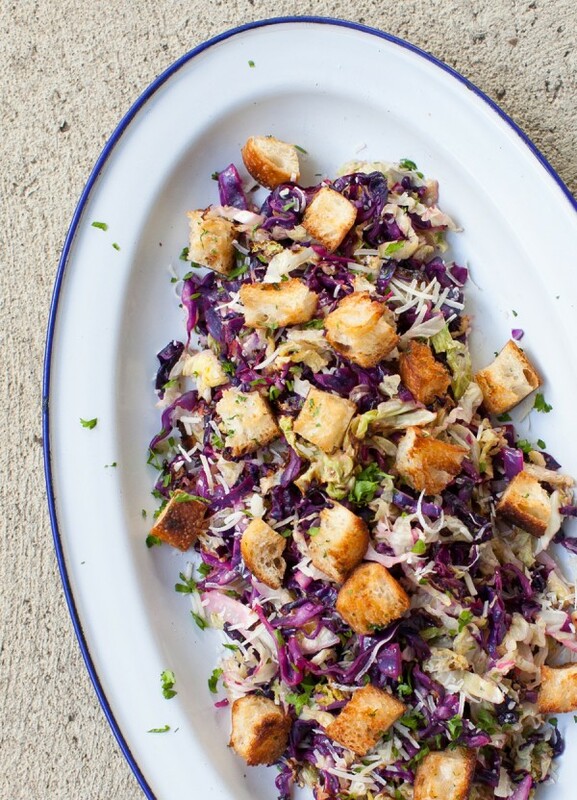 I’ve never heard of roasting shredded cabbage before, but this salad looks and sounds great.